Dragons that can turn into humans: Who wouldn’t want to read that? Julie Kagawa always delivers a really action-packed contemporary/fantasy cross over, and Talon was no exception. The premise is so original and I’ve never seen it done before, the whole logistics of it may seem a bit crazy, but if you can look over the fact that dragons the size of buses can squeeze into a tiny human frame then you’re in for a wild ride. When it comes to dual perspectives, I find it frustrating when they only ever know half the story even though the reader can see the full picture. It generally leads to a lack of tension, because the reader expects the big conflict to happen and has already predicted the outcome. Ember is a dragon and she’s desperate to cling on to her free summer, but there are a lot of restrictions placed on her, and she’s not the kind of person who just sits back and is okay for others to be in control of her life. Ember’s curious, but she’s also naïve, and I think she missed the idea that sometimes you really do need to listen to your elders, because believe it or not they do know best. Ember was going through her rebellious teenage stage and was ready to flaunt authority at every opportunity. For once, I would’ve been nice to have a main character that thought about what they were doing and how her actions would affect more than just herself. I have to admit, that I was taking Dante’s – her twin brother – side quite a lot. Garret is a member of St. George aka. The dragon slayers, and it’s up to him to find the sleeper dragon (Ember) and take her out. Garret interpreted take her out as take her out on a date! Introducing love interest number 1! I likes how he was an over thinker, and how conflicted he was over falling in love with the enemy. It’s just a shame that his future was predictable. And then there’s Riley, bad boy extraordinaire and rebel dragon classified as a Rogue. You can only imagine how curious and sceptical Ember reacted to his introduction. A boy who offers a life of freedom, and rule-breaking? Better fall in love with him too! He brought something new to the story in terms of being a vehicle for information and explanation, but his function as love interest number 2 was nothing if not clichéd. Ember and Garret were my preferred pairing of the love triangle. To be honest, I didn’t understand why Riley had to be a love interest. Now Ember’s divided between her human love interest and her dragon one. I mean, ultimately Ember’s a dragon so surely she should be with Riley, even though I much preferred Garret. Why the heck did Riley just start calling her Firebrand – is that her real dragon name? who knows! – it made me feel uncomfortable because he was falling in love with what he wanted Ember to be an represent rather than who she actually was. Tensions between the boys were also slightly ridiculous. Ember’s a dragon, for goodness sake, she can take care of herself! I do love a good protect her honour scene, but they should know better. Really, both relationships were slightly insta-lovey and their possessive anger when they saw Ember with another guy was really frustrating. Why do guys think it’s okay to hit each other, when really Ember owes neither of them ANYTHING. Riley is not entitled to be with her just because she’s a dragon. It’s Ember’s choice who she wants to be with! In some ways I think Talon would have stood out a lot more if there weren’t love interests. I think it’s quite jarring that the first book in this series is based in California, where Ember’s main priority is learning how to surf! It’s a strange mix of contemporary and fantasy elements, but overall I thought it was really successful! Talon is all about their hatchlings adjusting to human society so they can blend in, so it only really made sense for Ember to become your average teen! Of course, this is juxtaposed by Garret, the teenager who also doesn’t know how to be a teenager. Their conversations could be a little cringey, because they didn’t know how to act around each other, but really it was endearing. I think Talon mixed the two genre conventions well. There were slow and more romantic sections – they were weighed down with a constant sense of uneasy, but you know – and then there really engaging scenes where Ember tried to unravel the mysteries of the organisation. I have to say that those were the parts I liked the most, so I guess I have a lot to look forward to in Rogue. I’ll miss the ease of the contemporary aspects, but I think Rogue will be a lot more of what I expected this series to be. A lot of the other reviews I’ve read for this book say that it dragged in the middle, which I have to agree with. The whole Ember chasing Cobalt for information thing got old quickly, especially when he could only ever say one thing at a time. I was frustrated that he couldn’t just sit her down and give a big sprawling list of why Talon is the worst place ever, and it definitely slowed the plots progression, seemingly for no real reason. As for introducing the world and the organisation I think Kagawa gave just as much information as necessary to get readers hooked into the series. Although, there is still a lot of intrigue and mystery surrounding Talon, and even Ember herself – why are Talon so interested in her anyway? I’ve heard that this is going to be a five book series, so I can only assume that we’re not going to find that out for a while! 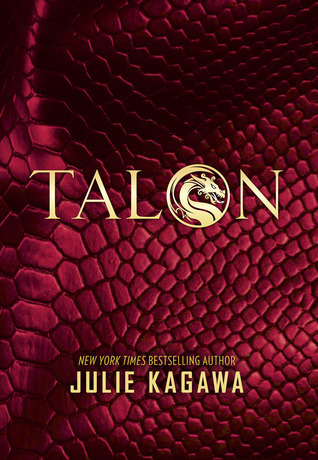 Overall, if you’ve enjoyed Julie Kagawa’s writing before, then Talon won’t let you down. I think I’m more inclined to say I enjoyed the Iron Fey series more, but I’m more of a faery girl than a dragon girl. I think Talon was a solid introduction to the series, and I’m looking forward to how it progresses. Therefore, I gave Talon 3 stars with high hopes for the rest of the series.